Chris Watson has announced a new audio installation, titled No Man's Land, to be hosted at Attenborough Centre For The Creative Arts in Sussex. No Man's Land is a 40 minute long site-specific piece that takes the listener on a journey from the shores of Brighton and out into the ocean where they will experience, in Watson's own words, "seals singing under Antarctic sea ice, the snap crackle and pop of a coral reef in the South China Sea, the haunting songs of the Humpback whales in the Caribbean and the hunting pods of Orca in the North Atlantic". 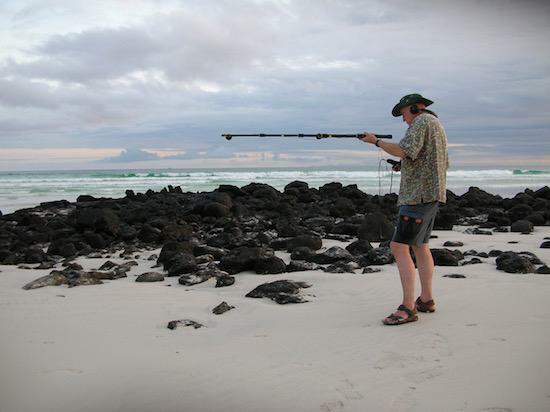 The new installation, however, is composed of recordings taken from Watson's 30-year career as a sound recordist working on nature documentaries such as Frozen Planet and Galápagos, something which has brought him great fulfilment. Speaking on a PodOmatic podcast, which can be found in full here, Watson said: "It's a real privilege to work with the BBC Natural History Unit. I have gone to the ends of the Earth and everywhere in between." "My aim with No Man's Land is to stimulate the imaginations of listeners and take them on a journey. There'll be sounds from the starling roost in the West Pier, as well as the signature sounds of Brighton beach; that wonderful harmonic sound of the water withdrawing through the shingle and pebbles." No Man's Land is also, to an extent, a response to noise pollution. "All over the place, people suffer from it. Sadly, even in the oceans - it's one of the by-lines of No Man's Land. Our seas and oceans are suffering even more from noise pollution, from seismic investigation for oil exploration to shipping noise. It's doing a lot of hidden damage." Listeners are encouraged to interact with the installation for full immersion. "You can sit down, stand up, lie down and engage with this journey and let the waves wash over you and take you to these places, from the Antarctic to the Arctic and just tune in to the sounds of the natural world." "We call it whale song, seal song… a lot of it is tuned to our ears. I regard the piece as a music event. I hope people will literally get taken by the ocean currents from one part of the ocean bed to another." No Man's Land will take place in the ACCA auditorium from 27 March to 13 April. For tickets and more information, click here. All quotes taken from the PodOmatic podcast.